Since July 2012, the United States has experienced a forced re-entry into the divisive, but necessary Civil Rights Movement. That movement sought equal rights and representation for all. While change was sought through tears, unrest and at times disobedience, the Civil Rights Movement resulted in the landmark Title VI of the Civil Rights Act of 1964, Voting Rights Act of 1965, and subsequent court victories. While these laws provide legal protections, the criminal justice system lacks the trust of the black community due to repeated abuse of force cases and unequal treatment. Military are forces authorized to use lethal force to protect and support government, state and citizen interests. However, military force must be authorized by Congress to address national and international concerns. In the absence of such authorization, military force is prohibited. 1) Officer presence (no force). 4) Less-lethal methods (blunt impact, Taser, pepper spray). According to the National Police Misconduct Statistics and Reporting Project, there were 4,861 reports of police misconduct in 2010. Excessive force was the most prominent type of report with 1,575 (23.8 percent) incidents. Of all 1,575 officers involved in reported excessive force complaints, 897 (56.9 percent) were involved in cases of physical use of force complaints which included fist strikes, throws, choke holds, baton strikes and other physical. 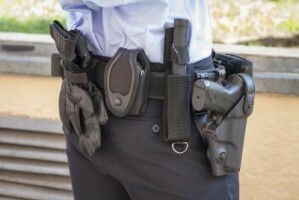 An earlier study by the Bureau of Justice Statistics showed males were more likely than females to have force used or threatened against them during their most recent contact with police during 2008, and blacks were more likely than whites or Hispanics to experience use or threat of force. The Black Lives Matter (BLM) movement commenced after Trayvon Martin’s murderer, George Zimmerman, was acquitted in 2012 in Sanford, Florida. Since then, the BLM Movement, the National Action Network and other social movements have utilized social media and public protests to draw attention to the racism that permeates the United States criminal justice system. On July 17, 2014, Eric Gardner, a black male, died after being placed in a prohibited chokehold by New York Police Officer Paleteo. Rev. Al Sharpton’s National Action Network organized a public protest when Officer Paleteo was not charged with murder. After Ferguson Police Officer Darren Wilson shot and killed Michael Brown, a black male, on August 9, 2014, the BLM movement organized a public protest demanding justice when Officer Wilson was not charged with murder. After North Charleston Police Officer Michael Slager allegedly shot and killed Walter Scott, a black male, on April 4, 2015, the BLM movement organized a public protest demanding justice for victim Scott. Officer Slager was charged with murder three days later after the release of video evidence to the media. 1) Information gathering (problem identification and background). 3) Personal commitment (self/organizational evaluation). 5) Direct action (creative tension to enact change). 6) Reconciliation (plan of action). One of the first issues to be addressed through the Six Steps of Nonviolent Social Change should be implementation of the End Racial Profiling Act of 2014 in every state. According to the National Association for the Advancement of Colored People, currently 20 state racial profiling laws are not clear and specific in prohibiting racial profiling, while 33 states do not require mandatory data on stops and searches. Additionally, 33 states do not require establishment of racial profiling commissions to review complaints. Public administrators who are willing to address this and related issues through Dr. King’s framework will be conduits for rebuilding public trust and minimizing skepticism. Author: Dr. Sheila Toppin is an assistant professor in the Public Administration Department at Clark Atlanta University. Email: [email protected]. What evidence is there that what happened between Trayvon Martin and George Zimmerman had anything to do with racism?